The annual China Central Television English Speaking Contest is regarded as the most difficult English-speaking proficiency competition in the country. It attracts millions of viewers from across the nation. The event is particularly well known and widely viewed in Xinjiang, one of China’s four provincial-level autonomous regions located in the northwestern region of the country. The reason? Uyghur students originating from Xinjiang have been dominating China’s English speaking contests since 2004. Despite the Uyghur ethnic minority group comprising less than one percent of China’s entire population, they seem to beat their rival contestants from some of the best schools in the country in both English proficiency and pronunciation to reach the final rounds of these nationwide competitions. What is driving so many Uyghur youths in Xinjiang to pursue English language learning, and what are some of their key motivations for becoming proficient in English? 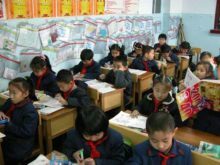 With the introduction of China’s “bilingual education” policy in 2004, Mandarin Chinese became the sole medium of instruction for all primary and secondary schools in Xinjiang. The policy relegated all minority languages like Uyghur to the status of second language subjects. The policy’s implementation also coincided with increased pressure on Uyghur youths to possess a high level of proficiency in Mandarin Chinese, as employers expected employees to solely use Mandarin Chinese in their work environments. However, the imposition of the 2004 language policy in Xinjiang also brought to Uyghur students a new level of freedom to choose a second language subject. Prior to 2004, a 1977 provincial language policy directive required ethnic minority schools in Xinjiang to provide Mandarin Chinese as the compulsory second language subject for students until the end of their secondary school education. Those aspiring to learn and become proficient in English therefore had to work through alternative channels, whether that was private English tutoring sessions or rigorous self-study. When the bilingual education policy came into effect in 2004, the opportunity to learn English in a regular school setting became a reality of Uyghurs for the first time. Recent ethnographic studies on Uyghur students show that their attitudes towards developing English proficiency is markedly different from their attitudes towards proficiency in Mandarin Chinese1. The interviews that researchers conducted with Uyghur students at the post-secondary level suggest that many of their participants saw competence in Mandarin Chinese as a necessity due to it being both the medium of education in the province and a requirement to pass state-administered examinations. In contrast, many chose to pursue English out of their own volition. They held a strong willingness to invest time and energy in their English language learning because they believed that reaching a high level of proficiency in English would bring substantial benefits to their lives. For instance, ‘opportunity’ was a key theme that was frequently mentioned in the interviews2, as students believed that learning about the English-speaking world through their English language training had broadened the scope of their imaginative horizons, and had raised their sense of what they might achieve in the future. Consequently, we have seen the emergence of a new generation of Uyghur youths with aspirations to travel, study abroad, and even immigrate to Western countries over the past decade. However, international study for English-proficient Uyghurs may soon come to a grinding halt as the Chinese government continues ramping up its security campaign in Xinjiang due to a series of violent attacks in China that the state blames on Uyghur separatists. Last November, the government implemented a province-wide policy requiring all residents of Xinjiang to hand over their passports to local police, making it mandatory for those planning to leave the country to formally apply for permission to retrieve their passports. Following the passport confiscation, Chinese authorities in Xinjiang launched a campaign in January ordering Uyghur students studying abroad in countries such as Australia and the United States to return back to their hometowns by a set deadline. As Beijing continues to tighten security and restrict movement in Xinjiang, the future of this new generation of English-proficient Uyghur youths seems uncertain. Sunuodula, Mamtimyn. 2015. “Second/Third language Learning and Uyghur Identity: Language in education for Uyghurs in urban Xinjiang” in Language, Education and Uyghur Identity in Urban Xinjiang, eds. Smith-Finley, Joanne and Xiaowei Zang. New York: Routledge. 95-113. Sunuodula, Mamtimyn and Feng, Anwei. 2011. “Learning English as a third language by Uyghur students in Xinjiang: a blessing in disguise?” English Language Education Across Greater China. Clevedon: Multilingual Matters, 260-283.